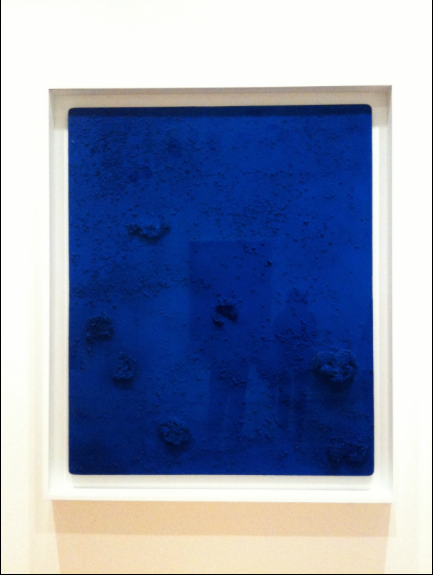 UPDATE: Daily Telegraph art critic Alistair Sooke writes on the August 28, 2014 BBC.com site about Yves Klein's successful development of the ultramarine pigment that cemented his fame: "Yves Klein: The Man Who Invented a Color." One of the chief reasons I translate writing by non-Anglophone writers is to make their work available to readers who would otherwise have no access to it. However imperfect and faulty my translations I always do hope they offer a glimpse into the work of the translated writers and the worlds from which they come. As a writer myself I always appreciate the opportunity to be translated; it has happened several times, and the most recent instance is one of the best, because the translator is one of the best, a poet in all senses of that word, with a philosophically inclined mind such that she is able to convey multiple layers in every text she carries across languages, including her own. I am speaking with tremendous gratitude about Nathanaël, whom I was incredibly fortunate to have translate one of my very recent poems, "Pensées (After Yves Klein)," a tribute in part to the great, problematic French conceptual artist whose work has haunted me since I first saw it years ago. Years ago through my job at NYU's Faculty Resource Network I met an artist-scientist, Dr. Adrienne Klein, also a fan of Yves Klein's, and our shared moments of Kleinophilia led in part to the poem "Klein Bottle," which references yet another Klein, the German mathematician Christian Felix Klein (1849-1925), whose non-orientable surface, a staple of topology, the poem invokes. That was an oblique reference to Klein (Yves)--and of course Adrienne and Felix Klein, and mathematics and science--but "Pensées (After Yves Klein)" is more direct. 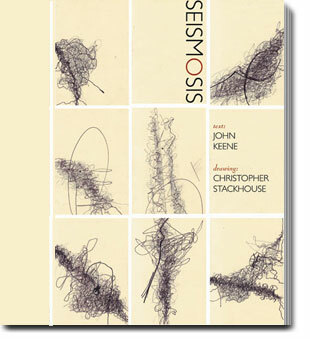 Klein also was one of the intellectual spurs behind one of the most enjoyable classes I ever taught, "Topics in Creative Writing: Conceptual Writing/Art," in 2010. (I fantasize about teaching an updated version of that course at Rutgers-Newark!) I want to say that until that same year, as a result of a mini-exhibit of Klein's work at the Art Institute of Chicago I had never seen any of his paintings or sculptures in person, but this is not correct; a little retrospection reminds me that I certainly did see Klein's work in other museums, including the Guggenheim Museum, which owns several of his works, and MoMA. Encountering Klein's "Blue Sponge Relief" (pictured above) and other images at the Art Institute back in 2010 laid a deep anchor, though, and recently, as I was writing poems about artists and artworks, the "Pensées" emerged. Since they were about a French artist I sent them to Recours au poème's founding editor, poet and critic Matthieu Baumier, with whom I'd exchanged some emails around the time the online site first began publishing, and did not hear anything back, so it was a surprise and pleasure to learn that Nathanaël would be the translator (she had previously translated some of the poems from Seismosis and succeeded in bringing into French the English rhythms yet also creating a similar, novel music in French), and that she also was preparing a short introductory essay, "Arraisonner le vide" (roughly "Investigating the Void") which manages to encapsulate in a paragraph much of the conceptual richness I was seeking to convey. She also discusses some challenges in translating between the two languages that English in particular produces. I had not thought about it when writing these "Pensées," which are haiku-like in their brevity, but Nathanaël astutely identifies in so many words English's parallel vocabularies, which I drew on. "White" (from English's Germanic roots) and "blank" (from its Norman-Latin ones) are the same word in French, blanc; the same is true with "emptiness" (from Old English) and "void" (from Norman and Latin), which translates as vide. In addition, Nathanaël finds not just an equivalent, but a convincing French music for the English, even as she stays very close to the English syntax. That is quite an accomplishment. You can find the essay and the entire poem in translation at the Recours au poème site, which if you read French is a bonanza of contemporary Francophone poetry, and I highly recommend it. My former colleague Reginald Gibbons has a series of poems, also beautifully translated by Nathanaël, on the site. Below is a snippet of my poem. Now I just need to find a place to publish the English original! 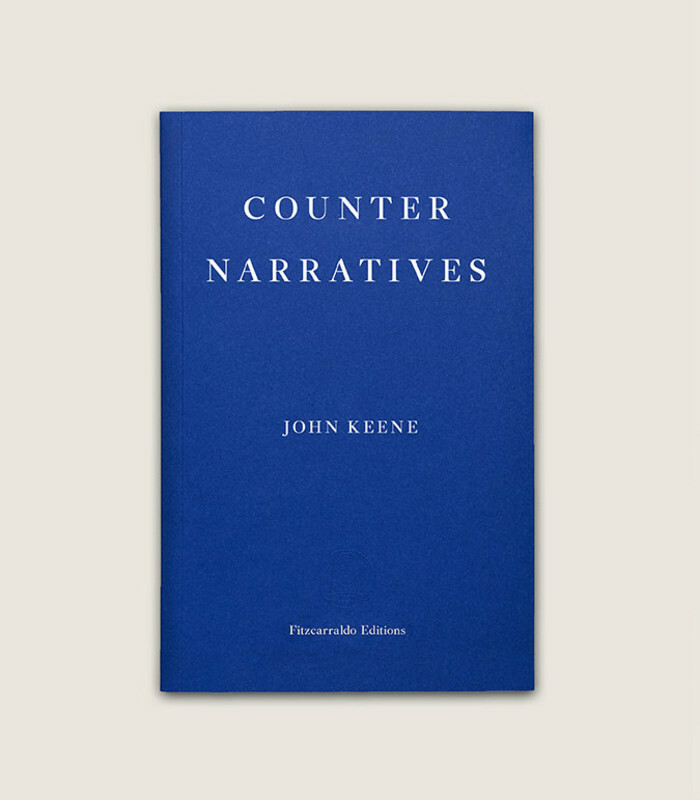 From "Pensées (After Yves Klein)"
Copyright © John Keene, translation by Nathanaël, 2014. All rights reserved. 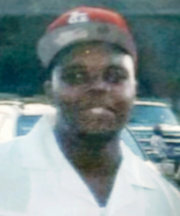 --and in particular, the unnecessary and noxious "Michael Brown...was no angel," subjectively singling out this teenager, whose life was tragically cut short when he was shot dead by policeman Darren Wilson in cold blood, in a way I have almost never see or read for any other major public figures with any life issues, including long histories of drug use, criminal activity, and worse, I became enraged. 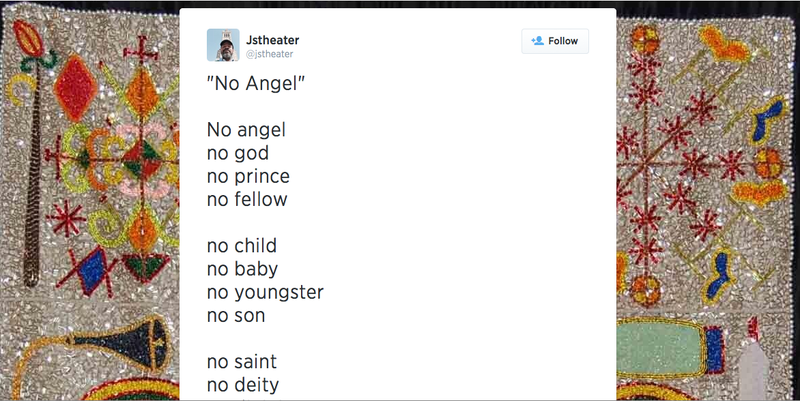 Yet rather than just stifling or sublimating it (and Eligon's piece provoked a brouhaha, including considerable backlash, all across social and traditional media), I stopped what I was doing at the New York Public Library and wrote out a poem directly on Twitter, titled "No Angel." Since not all of J's Theater's readers are on Twitter, I am sharing the poem here, edited and with an additional stanza). It is a tribute in and of the moment, to Brown, but I think it works on its own, and the relationships between and among the chain of metaphors and metonyms, as well as the ironies contained within, should be clear enough. To his memory and many others in his situation: RIP. On Saturday, August 9, 2014, in Ferguson, a predominantly black, inner-ring suburb in Saint Louis County, Missouri, under circumstances that remain murky but for which there are non-police witnesses who have spoken on the record, Michael Brown, an unarmed 18-year-old recent high school graduate who was heading to Vatterott College, was gunned down by a policeman. The Ferguson police force, which is predominantly white (50 of 53 officers), have alleged that Brown was shot repeatedly after a struggle with a white officer, whose name the police force initially would not release (It since has: Darren Wilson). According to the Saint Louis County police chief, Joe Belmar, around noon on Saturday, after an alleged tussle in and beside Darren Wilson's police cruiser, during which Brown supposedly attempted to grab the policeman's gun, Brown was shot, several of the shots occurring over three feet from the police car. Several witnesses, including one, Dorian Johnson, who was with Brown right before the shooting, have disputed the police's account, however, attesting that Brown had his hands up when he was initially shot. After he was killed, Brown lay in the street for hours, as shocked local residents watched and photographed it, until his body was finally collected and taken to the morgue, where an autopsy on Sunday showed that he died from multiple gunshot wounds. Brown's grieving parents retained attorney Benjamin Crump, who represented the parents of Trayvon Martin, the Florida teenager who was shot to death on February 26, 2012 by George Zimmerman after a scuffle in the gated community where Martin's parents lived. Brown's killing would been horrible enough, but following his death, which has both followed and preceded other widely reported killings by police forces of unarmed black people in the US, including Staten Islander Eric Garner's death by stranglehold on July 17, 2014, Ferguson residents and others in the St. Louis metropolitan area decided to hold a candlelight vigil. The Sunday evening event then turned violent when some people, who may not even have been vigil participants, began attacking and looting local stores in Ferguson and a neighboring suburb, which resulted in over 30 arrests and injuries to two officers. For a number of US media outlets this turn of events became the focus, and not the tragic, unexplained murder of Brown, the fumbling response of the Ferguson police, or the specific and larger contexts in which Brown's death occurred. On Monday protesters showed up outside the Ferguson police department to demand a full investigation of Brown's death, and shortly thereafter at a press conference Brown's parents, mother Lesley McSpadden and stepfather Louis Head, publicly called for an end to the violence, while also imploring local officials for justice for their deceased son; alongside the Ferguson police department's efforts the FBI announced that it would launch a parallel investigation to that of the St. Louis County Police Department. Monday evening the NAACP held a prayer meeting that brought together local leaders and residents. Afterwards, in a turn of events that caught the attention of a global audience, a subsequent peaceful vigil on West Florissant Avenue, one of the main strips through Ferguson, was met by the terrifying response of the militarized Saint Louis County police force, supplementing Ferguson's officers. The county forces, like an occupying army, used tear gas to disperse local residents, shooting canisters into front yards, and included snipers, officers on tanks, and machine guns that matched or exceeded the sophistication of weaponry used in the US's wars in Iraq and Afghanistan. Vigil participants were captured in photo after photo holding up both hands, as Brown was said to have done before being shot, with the police forces training their war-ready weapons upon them. On Tuesday, justice seekers rallied in front of the Saint Louis County Police Department, in the county seat of Clayton (where Washington University is located), and the Rev. Al Sharpton arrived in Ferguson to meet with Brown's family and spark further national attention for the tragedy. It was also on Tuesday that President Barack Obama offered public comments on Brown's death, that the US Department of Justice announced it would launch a federal civil rights investigation, and that Missouri's Democratic governor, Jay Nixon, met with St. Louis City mayor Tom Slay and other local leaders to discuss the ongoing crisis. Yet the evening standoffs between the protesters and the hyper-armed police force continued. Because of these, on Wednesday morning Ferguson called for an end to evening vigils; when people sought to remember Brown's death peacefully at the end of the day, the police again responded violently, shooting rubber bullets and wooden plugs into the crowd, firing tear gas at them as well as reporters from Al-Jazeera covering the event, and going so far as to arrest a St. Louis City alderman, Antonio French, and two reporters, one from the Washington Post, Wesley Lowery, another from the Huffington Post, Ryan Reilly, after rousting them from a local McDonald's restaurant. Finally, yesterday evening, Missouri's Democratic governor, Jay Nixon, having previously called for calm but without taking any concrete steps to ensure it, had the Missouri State Highway Patrol take over the policing of Ferguson's protests. The person now in charge, Highway Patrol Captain Ron Johnson, a Ferguson native and resident of nearby Florissant, not only de-escalated the police response, but marched with protesters. One wonders what would have happened had this been the response five or even two days earlier. President Obama also delivered a public address on the crisis in Ferguson from his vacation redoubt, though he added little to the discourse beyond calling for the local police to be "open and transparent" in their investigation. Across the US and globe, silent rallies and marches, beginning at 7 pm and organized under the social media hashtag #NOMS1, took place; in New York, vigil participants filled Union Square and marched through Times Square. Today, the Ferguson police released information that Brown had participated in the theft of cigars from a local convenience store; Dorian Johnson's attorney has acknowledged that Johnson was with Brown in the commission of this crime. If this is true, Johnson should and will be prosecuted, as Brown should have been; Missouri is not now nor has ever been known for letting black people alleged of criminal behavior, however light the crimes, off the hook. But even with this new information, the fact remains that Brown, like Garner, like Ramarley Graham in the Bronx, like Rekia Boyd in Chicago, like far too many black people, whether accused of a crime or not, did not deserve to be summarily shot dead. There is a structure, a system, and multiple well-defined processes for adjudicating alleged criminal behavior; vigilante state murder by "peace officers" is none of these. As is probably well known to anyone who has read my work, let alone who knows me, I was born in the city of Saint Louis and spent roughly half my life up through the age of 18 in St. Louis County, in the suburb of Webster Groves. (It is the same suburb that Jonathan Franzen grew up in, and the home of two institutions of higher education, the Protestant Eden Theological Seminary and Roman Catholic Webster University). Webster Groves, like Ferguson and many Saint Louis suburbs, was and is divided geographically by race; north Webster, where we lived, was predominantly black, while south Webster was predominantly white (and much wealthier). In fact, one can draw a line through the middle of fan-shaped St. Louis City and the collar-like county, and quite reliably predict the race of who lives where. North of the city line is black; south is white, and the same holds true for the suburbs: north are the formerly white and integrated suburbs, some of which, like Ferguson, white flight has transformed into predominantly black suburban towns, and south are the mostly white suburbs, which are less wealthy. Fanning out westward are the wealthier suburbs, with larger non-white populations closer to the city, and smaller ones the further west you go. To put it simply, it is the case that over the last four decades as black people have moved from St. Louis City into its suburbs, white people have moved--fled?--further and further west, or south, or north, taking jobs and wealth with them, and have only recently returned to a revitalizing, gentrifying downtown area of the once-hollowed out core city. 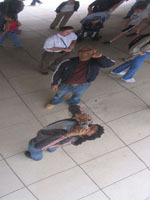 One can find mirrors of this process all over the US (in Chicago, Detroit, Boston, Atlanta, Los Angeles, etc. ), as well as analogues to the internal racial and spatial divisions. In St. Louis County as in suburban New York or New Jersey or Boston or Birmingham, or in many parts of the county, one can usually point not just to which suburbs are more or less white, but where in a given suburban area, as in the core cities, the races live. As has widely been reported, Ferguson's demographics have changed, but its power structure, the mayor, the city council, the police chief and department, and so forth, remain mostly white. Perhaps this reality predicted that at some point Ferguson would blow up, but I would imagine that if you asked most St. Louis-area residents where in the region what we have all witnessed over the last week would take place, Ferguson would not be high on the list. The City of St. Louis might be readily named, because St. Louis City has seen its share of violence over its 250-year-history, though it was spared the uprisings of the late 1960s (its sibling in Illinois, East St. Louis, was not so lucky, then or before). Perhaps you might hear people name some of the poorer suburban towns in North County, or some of the towns in the south suburbs where overt racism is not unknown. But, despite the problematic indicators, not Ferguson. Our larger public discourse and visual culture still too seldom reflect the diversity, or the demographic shifts and attendant sociopolitical shifts, which have transformed American suburbs over the last four decades. Indeed, the images of Ferguson before and after Brown's murder belie the visual narratives we usually encounter; American suburbs have increasingly browned since the 1970s. My own family participated in this demographic shift, as have millions of African Americans and other people of color. In some places the John Cheever-John Updike-Richard Yates-A.M. Homes suburban world may still exist, but there are now many more Fergusons out there, as the last US Census made clear, than our news media or Hollywood ever deign to depict. This conceptual blindness and indifference is particularly dangerous not only because it promotes ignorance about the reality of American life, but also because it helps to increase the possibility that what happened in Ferguson could happen all over the US; police beatings and killings of black Americans have sparked uprisings repeatedly through US history, as has been the case with numerous riots (1969, 1983, 1984, 1989, 1992!) in Miami, or the Los Angeles Uprisings after the videotaped beating of Rodney King in 1992, but suburbs could as easily become flashpoints as the urban areas that are now under economic and political contestation as gentrification and economic and social displacement work the perverse counter-magic of racial and ethnic partitioning and cleansing. Our political and social fabric in cities and suburbs across the US, well into the second term of President Obama, remains tinder for enraged responses by people who are still treated as second-class, not-fully-human, semi-citizens; who are viewed as superfluous, whose lives we still see daily are thought to have less value and importance; who have long been denied full participation in American, full access to humanity, in this society; who must move through their daily lives with the added tax and burden of racism and white supremacy underpinning every aspect of the world around them; who are not viewed as integral to what the country has ever claimed to mean by the word "Americans"; who are viewed, to invoke Keguro Macharia, and other theorists, as completely and utterly disposable. You do not shoot someone in the back and let his body lie in the summer sun, no matter what he has done, unless you view him, and others like him, as disposable. You do not choke a person to death, when he is crying out that he cannot breathe, unless you view him as disposable. You do not empty your handgun's magazine twice, issuing more than thirty shots, into three men who are not armed. You do not mis-or-undereducate millions of people; you do not disinvest in and thereby eliminate opportunities for gainful employment from millions of people, starving them through incalculable, invisible legerdemains of austerity and greed; you do not provide zero or sub-standard health care to millions of people, and use their poor health to impoverish them further; you do not poison and destroy the environment in which millions of people live and work, again using this as a tool to extract every thing you can out of them; you do not perform a false pantomime of justice and equality, in courts of law, in places of employment, in stores, in the pews, everywhere, before millions of people for whom you do not want real justice and quality ever to be possible; you do not warehouse millions of people, whom you view as nothing more than commodities to provide jobs for others in whom you have disinvested, and mere bodies for cheap labor to enrich the bottom lines of privatized prison corporations, unless you view them as disposable. You do not demonize and dehumanize an entire race people, through language and images, persistently and consistently for hundreds of years, changing the surface code and semantics as needed to maintain your power, and then appeal to your innocence and pretend that you have not. Indeed, you cannot appeal to any category of the human or human rights because you have systemically denied the humanity of the people all around you. You do not arm a police force as if it is an occupying army ready to slaughter everyone in its crosshairs, and train it on people living in your midst (or on other people across the globe, for that matter). Much of what I describe here applies not only to black people in this country, but to anyone who is not (considered fully) white, and to white people as well, especially poor ones. But the fact since before this country's founding is that black people bear the brunt of this logic of disposability, we are the ne plus ultra on which this logic, concomitant with anti-black racism and white supremacy, was established and perfected, and until this logic is completely overturned and dispelled, so long as we remain here, and we will remain here, we will remain the most disposable of all. This is the world Michael Brown and others like him, live in. This is the world that I, who have several degrees and teach at a university and have published and translated books, live in. This is the world that our President, the leader of the "free world," lives in. Until the economic, political, social, and juridical foundations on which this society has built its entire edifice truly and fully change, until we extirpate the structural and systemic racism and white supremacy that underpins everything, the kind of murder and the crazed response by state forces that we witnessed in Ferguson very well will continue to occur. It was horrifying, but hardly a surprise. It was a tragedy, but not unforeseen. But very likely almost nothing, beyond rhetoric and shadowplay, will transpire among those with real power, who have a vested interest in keeping things as they are. We should feel disgust and horror at what has occurred in Ferguson, and Staten Island, and Beavercreek, Ohio, and Los Angeles, and Harlem, and everywhere a scenario like this unfolds. But that is not enough. What must also occur, in as many ways as are possible, is to change the structures of this society so that the groundwork for what we have witnessed and continue to witness is not already laid, that this tragedy is not again foreordained. We cannot change our past, but we can reshape our future. NONE OF US is disposable. I know this will not be the last time I write about a tragedy of this sort, and I certainly will not forget Michael Brown, or Eric Garner, or John Crawford, or Ezell Ford, or Dante Parker, or Rekia Boyd, or Tarika Wilson, or Gabriella Nevarez, or Tyisha Miller, or Yvette Smith, or Ramarley Graham, or Oscar Grant, or Sean Bell, or Ousmane Zongo, or Amadou Diallo, or Eleanor Bumpurs...or Trayvon Martin. But what I do hope happens this time, as with every prior time, is we make even firmer our commitment, at every level, but especially as a society, to ensure that we will not have to relive a version of this story, with only the particulars changed, once again.